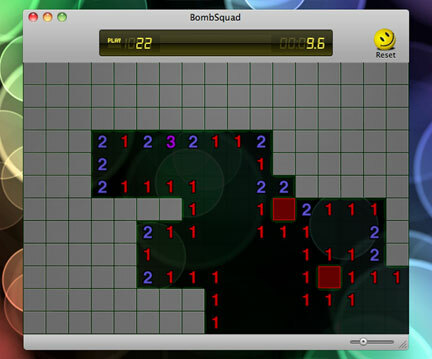 The explosive new minesweeper clone for Mac OS X. Use the following links to find out more about this fun and addictive game. BombSquad is localized in English, German, French, Italian, Spanish, Japanese, and Dutch, and I'm looking to add more. Please email if you can help! Now with an Aqua candy shell! OK, so it looks like minesweeper. The toolbar features a new LCD timer display as well as the reset button. You can adjust the size of the playing field by dragging the lower right corner of the window (or any edge on Mac OS X 10.7 "Lion"), and change the size of the grid by adjusting the slider in the lower right. Make a wrong move and BOOM! 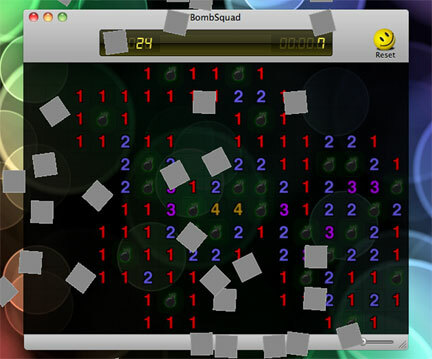 Explosive fun you won't find in any other minesweeper clone. In my opinion, it's the best looking minesweeper out there (but I am biased, of course). Download and judge for yourself!